I started writing this article about ideas to get your business to the next level and I thought it might be a good idea to Google the phrase and see what other people are writing about. Did we really need another article on it? Was I in for a shock. After a few searches I realized that everybody had a different set of ideas. On top of that this diversity trend went on and on for pages and pages in Google. No wonder business-people get confused about how to take their business to the next level. It’s almost impossible to identify the really good ideas or get straight answers. So I decided to write an article that was different from the rest of them. This might seem to be piling on to the madness, but I believe that I have something valuable to add. I’ve gotten my own companies to the mythical next level – a few times – in two different lines of business. As we used to say in the old days: I’ve signed on the front of paychecks. Which means I’ve built companies and managed growth before. From what I can see this makes me different from the other authors writing articles on the subject – they certainly know about ranking on Google, but their business experience seems thin. Also since 2001 I’ve been a professional business coach helping business-people reach the next level in a wide variety of industries. This includes companies all the stages of growth from startup to succession. I’ve always thought of it as breaking free – taking flight – and changing your day-to-day reality. Most people that want to get their business to the next level are already at a level that many others admire and respect. We’re talking about a piece of the entrepreneurs’ journey. It’s a slice in time. The next level means the NEXT level, it shouldn’t mean ten steps ahead. It should mean a difficult but doable project in terms of the development of the company. As you look at more and more companies you’ll see an increasingly wide variety of ideas about what the next level actually means. With a bit more investigation you can also see an underlying structure or consistency to the next level aspirations. That means there should be a framework for the solutions and a way to evaluate the ideas for getting to the next level. To look deeper into this concept I’d like to present a baseball analogy. Entrepreneurs whose companies consistently get Home are successful. That’s where they have both time and money available so they can be entrepreneurial again. They also have hard earned experience and contacts. It puts then in position to make bold moves. This is what we call getting the Entrepreneurs’ Second Wind. The second wind is an analogy borrowed from marathon running where a runner – after a period of hard work – gets a renewed strength and achieves top performance with less exertion. Actually the egg came first. Dinosaurs were laying eggs long before there were chickens. The idea is to get the business model working and the company scoring runs. That’s likely a stepping stone on your long-term journey. Sometimes people will tell me they need to grow and get more business to score runs and they may well be right. My first instinct is to see what can be done at the current size – this level – to be profitable. Maybe this size with more cash flowing to the bottom line is the next level. 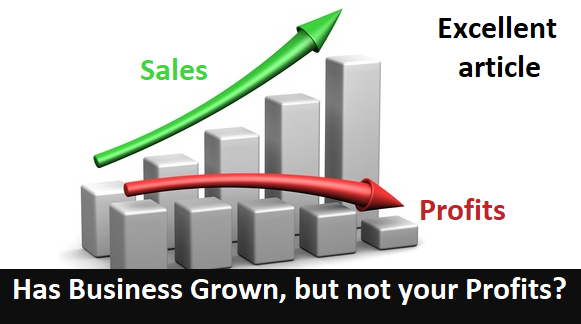 Getting bigger without being more profitable is rarely the answer. The best idea is to get profitable now and stay profitable. That way the frustration of seeing what you want – being stuck – just out of your reach won’t be something you experience. Instead of seeking the big jump next level you’ll be going up the stairs. Pricing to the higher end industry standards. Don’t sell yourself short. People like to deal with owners and your time is worth more than the apprentice your competitors will send. Seriously forget about the I can do it cheaper crap. It’s a toxic mindset. It takes courage to implement an above average pricing strategy. Figure out how to communicate the value you offer AND that you will do a better job – then deliver on it. About nine percent of the consumers are grinders looking to beat everyone’s prices down. If you listen to them about the value your company offers it can literally shave good years off of your life. Price for YOUR success. Be wary of hiring salespeople. Even if you don’t think of yourself as a natural born sales person delegate this function with great caution. Note: most people don’t like to be sold to but, they do like to be helped. Sometimes you hear help your customers but, but that can just be more manipulation. The closer your sales process is to helping people and asking for the order at the right time the better. Take the time to document the process of setting the work up properly. Think about how to get the prep work done well. That’s what your customers are interested in. Once it’s documented then think through how to train someone to do it and document that as well. Then do it yourself or find someone who likes to help people. You don’t even have to delegate the whole process. Some steps in could be effectively handled by a junior that you might already have on staff. Hire a virtual assistant to answer the main phone line. Don’t give your mobile number out. It will make you look bigger and you should have ongoing discussions about how many of these incoming calls result in something that can be completely handled by the virtual assistant. If you are thinking that you already don’t have enough to do and why should you hire somebody else – even a virtual assistant (VA) – then use some of time that you apparently have to spare and phone VAs until you find one that has helped somebody like you grow their business. 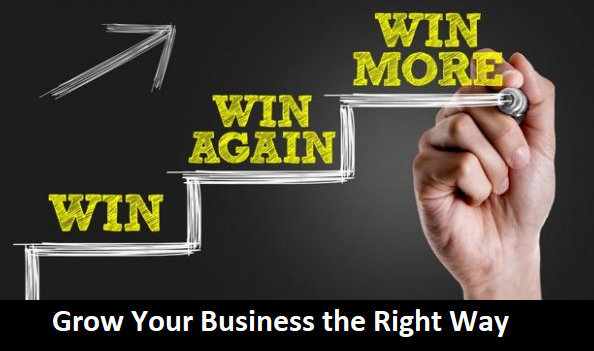 You need to be active and find out if there really is a market for your business offering. To get to the next level you need to know it your business idea is going to work as a viable business model. Now is likely as good a time as any to find out. You don’t want to be like the inventors of the barcode Norman Woodland and Bernard Silver who were decades ahead of their time. In 1948 they had a great idea for a billion dollar business, but the technology to support it and the world in general, just wasn’t ready for them. They lost money on the idea. p.s. I don’t have any shares or anything like that with VAs. It’s just the way the new economy is starting to materialize. People with certain skill sets don’t actually need 9 – 5 jobs to earn a living anymore, but you can effectively put them to work for your comapny. Level 1 was about getting control of the business and positioning yourself to start building your company. A metaphor is getting out from in front of the bulldozer and climbing up into the cab where you can effectively start to operate the controls and shape your landscape. If you company is getting around Second Base, but not reaching Third Base then try these ideas. Forecast you next 12 monthly Income Statements. Make each type of your business activities report like a Profit Centre. Parts and Service are two fairly simple and common ones. As time passes and actual Income Statements roll into your forecasted ones check to ensure each of the Profit Centres is achieving the margins and volumes you expected. Also divide your overheads into Cost Centres like: Facility, Management & Admin, Sales and Marketing, Financial and Vehicle Expenses for example. This makes them easier to manage. Schedule regular reviews. Business is a numbers game. This is a very good process for both checking the assumptions in your business model and for identifying areas that need to improve for your business to reach the next level. Developing a dashboard of Key Performance Indicators (KPIs) is another good idea. The KPIs should provide clear feedback for your staff. There is an old saying from management guru Peter Drucker: “What get measured gets improved.” While I don’t agree with the absoluteness of his statement, it is clear that measuring puts the right kind of attention on key factors and improvement generally follows. You are past being a lone wolf. You own a company. Look for processes to effectively involve others in the discussion about your company’s current performance and future. From employees to mentors to peers it pays to learn how to develop conversations about your company. There is an old saying two minds are better than one. Well then many are better than two when – and only when – you learn how to effectively manage and filter the conversations. Who do you realistically want involved? How can you get the best interests of the company consistently up on your employees’ radars? These are good questions that have workable solutions. You shouldn’t give up decision making and the big choices are yours, but the additional discussion will expand your options for getting business to the next level. The top business people in the world like Mark Cuban and Richard Branson invest a lot of their workdays in meetings. It begs the question: did they get good at meetings and then become successful or was it the other way around? This a good time re-introduce the idea of documenting systems. Although this time the challenge is completing the project and systemizing the entire company. You should start by creating a system for systemizing. It doesn’t have to happen all at once. It’s okay for this to be a project that takes months to complete. And then it never really completes as the conversations, revisions and updates continue as long as the business does. The benefits are an almost immediate performance improvement as the activity of documenting systems naturally pairs with a discussion of the most efficient and effective way of doing things. The hidden benefit is that it makes it easier for people to move up in your company – into new positions or just assigning additional responsibilities. Training people becomes straightforward when your systems can show trainees how to perform the functions. The help you need to create the time you need to move your company to the next level may be closer than you think. Many times the people are already there and want to move up. With a systemized company you can confidently pick a timeline and get started. It reduces the risk because everyone is a known quantity and ensures that you get the outcome you want. Level 2 was about getting your business model working and building a company that consistently scores runs. This is when it gets to be fun. Your company is consistently scoring runs and you have the time and capital to invest in exciting business opportunities. You also have solid business experience to bring to the project. 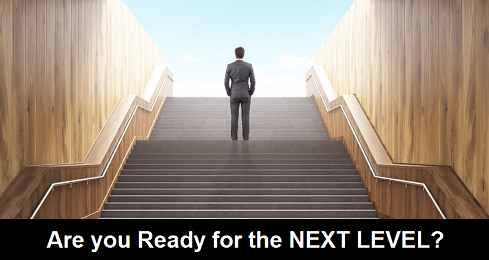 How to get you business to the next level typically involves growth. This means a bigger, better, faster marketing plan. It makes sense to create a detailed plan for the first year of the next level. Break it into monthly segments and fully cost it out. To do this you’ll have to drill into it and think through what the next level means to you. This also allows you to test parts of your marketing plan in advance to ensure it will work the way you want it to – when you need it to. Look for a competitive advantage. It could be an emerging technology like Netfilx used to take over the movie rental business. Uber and Airbnb. Spend some time connecting with and/or mentoring young technology entrepreneurs and be curious about what they see in your industry’s future. It could be as ordinary as increasing buying power and sourcing from lower cost suppliers than your competitors can access. It could be better products or improved services that lead the market. The main idea here is to deliberately be at the forefront to see the disruptive trends first and get to market before your competitors. Take your knowledge and experience to a different type of business. Identify what you do very well and look to see what other types of business could use your proven approach. Perhaps begin a new to you venture and partner with a company in another space that can benefit the most from your expertise. The third next level is about bringing the business smarts you’ve developed and testing it in a new arena perhaps a larger version of your current enterprise or a possibly an exciting new venture. Getting your business to the next level often means different things to different people. If you didn’t see the idea or ideas you need here feel free to contact us at Rock Solid. Initial consultations are no charge and no obligation. At the very least most companies can use some ideas about increasing profits and most owners can benefit from delegating better. Time, money and good ideas are valuable assets for getting your business to the next level. Sometimes getting to the next level is about fixing what is holding the company back. It can’t fly when it’s weighted down. Getting lift off is as important as knowing which airport you want to land at. It helps to think in terms of takeoff and landing. To reach the next level something has to be left behind. I wish you the best on your journey forward. If you found this article valuable please feel free to leave a comment below. 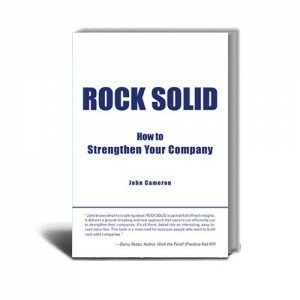 ROCK SOLID is a well written book that is packed full of common sense advice and innovative new concepts that have proven to work very well. To find out what our clients are saying about us click on the image above. Our process works! When you're taking the next step it helps to have experience on your side, Read this article for ideas from someone who has been there many times and also coached hundreds of others through the process. Click on the image above to read more. An ancient parable puts business problems into perspective and serves to open up some powerful options. A very good read! 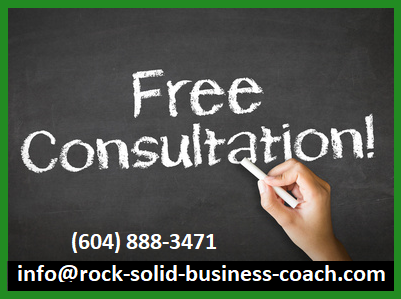 Rock Solid delivers high quality business coaching and consulting. 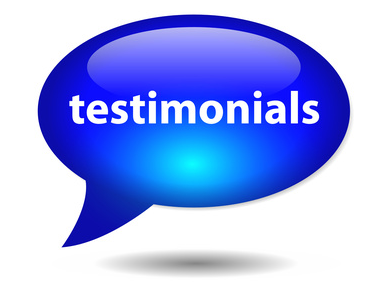 Check out the Testimonials to see the results they get for their clients. As frustrating as this is - it's more common than most people think. Growth brings both challenges and opportunities. 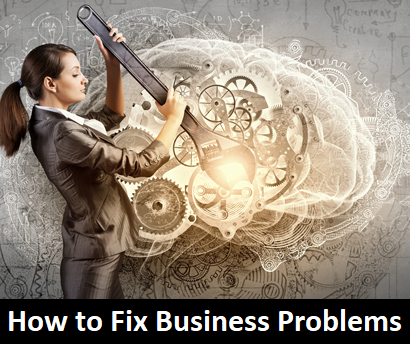 This article will help you navigate this stage of your business. This is a short but interesting article with a valuable point. Our no charge consultations come with no obligations. We're interested in meeting with entrepreneurs to discuss business. 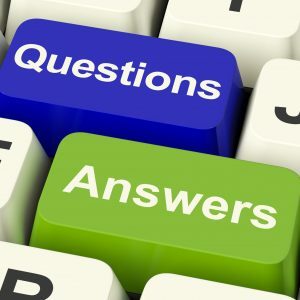 If you have a question we'd like to hear from you. Click on the image above for our Contact Page.